There are hundreds of career paths you can take within the field of criminology, and a large number of them are sworn law enforcement jobs. Law enforcement careers offer many benefits you won't find in other jobs, including early retirement, clear-cut opportunities for advancement and job diversity. But before you can take full advantage of your career as a law enforcement officer, including becoming a detective or working your way up the chain, you have to make it through the police academy. Law enforcement agencies have rank structures that are very similar to the military. Typically, a police department's chain of command will start with the rank of officer or deputy, or in the case of state agencies, trooper. The ranks will include sergeants, lieutenants, captains, and majors. At the bottom of the ladder is the police academy recruit. Above all else, police academies are places of learning. Each state has different requirements dealing with the mandated curriculum and training hours a recruit has to have before getting law enforcement or POST certification. Typically, academy recruits will spend upwards of 800 hours or more in training before they graduate. Most of this instruction takes place in a classroom. Academics are very important in police academy training. Recruits usually take at least one test a week while they are in the academy, and there are strict rules in place about getting a passing score. In Florida, for example, recruits must receive an 80% or higher on each test while they are in the academy. If they fail to achieve an 80% on any test, they have to leave the academy. Developing effective study habits is essential for academy success. Besides the academic requirements, recruits have to be proficient in several areas considered to be "high liabilities." These subjects include firearms, defensive tactics, first aid, and vehicle operations. The high liability courses involve long and grueling days. Recruits may spend hot summer days outside on the firearms range, or they may sweat it out on the mats in defensive tactics. Due to the intensity of the training, injuries are common. The type of academy a recruit attends has a great deal to do with how the day-to-day life of a recruit may be structured. In some states, police training is decentralized and conducted at local community colleges or academies. These academies tend to reflect a more collegiate atmosphere. In others, there may be one police academy that provides law enforcement training for the entire state. Some police agencies may host their academy. Law enforcement agencies that hold their academies tend to have the most rigid training because their recruits are also hired as employees. This allows the agency to exert more control over their recruits and impose stricter disciplinary standards. These academies are usually run similar to a military-style boot camp, where push-ups, leg lifts, and other forms of physical exertion are used as means of correcting even minor infractions. A day in the life of an academy recruit may include a 5:00 a.m. wake up for morning physical training. This might consist of a morning run or calisthenics. After PT, the recruit will have breakfast and then a short time to get cleaned up, showered, shaved and in uniform for the day. Before class, there may be a morning inspection and push-ups for rule violations. Academy life is both strenuous and exhausting, but it's also fun. In the academy, memories and friendships are made that will last well beyond your career. Those who can tough it out emerge smarter and stronger for their efforts. 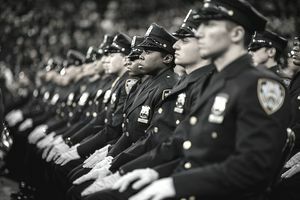 The police academy prepares recruits to face the stresses and rigors of police work, and it's the necessary first step toward a successful career in law enforcement.